Sweet Home Alabama is an immensely popular song that people love listening to, so they’ll love listening to you playing it. This lesson will also improve you’re lead guitar technique, since you’ll be using single string plucking to play the song. It’s based on a D - C9 - G chord progression, so chords you’ll most likely be familiar with already. The most difficult part of this song is probably the hammer-on, pull-off sections, you’ll need to practice those for a while if you haven’t been playing the guitar for too long, but consequently, it will give you a great chance to practice these techniques. Don’t worry though, it’s easier than it seems, the point is to keep on practicing, and your skills will improve with time. So to sum it up, the Sweet Home Alabama guitar lesson will give you a chance to develop a wide array of lead guitar techniques, which you’ll be using later on in tons of other songs, and with time, in improvised licks. 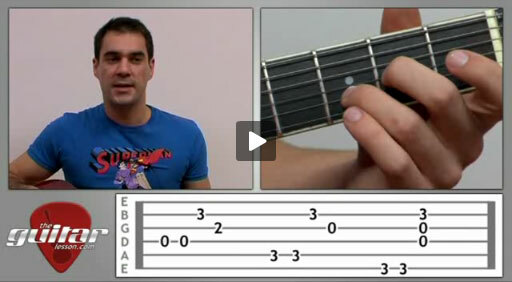 Once you're finished with this song, have a go at another one of our guitar lessons for beginners. Sweet Home Alabama was released by Lynyrd Skynyrd in 1974 on their second album, Second Helping. Few people know that the band’s name inspired by a gym teacher the founders had in high school, Leonard Skinner. The song deals with racial segregation, so it was pretty controversial at the time of release. As of 2009, the U.S. state of Alabama has actually started using the phrase "Sweet Home Alabama" on vehicle license plates, as an official slogan of the state. The funny thing is that none of the three writers of the song were originally from Alabama. The song has been covered by several musical artists and used in a many commercials and movies since its release. Sorry, but you've reached a premium content area. The download of the Sweet Home Alabama tablature file is only available to premium members. Sorry, the same goes for the backing track. To download the backing track to Sweet Home Alabama, please log in and revisit this page.